We’re working on behalf of Conservation International to support the business case development efforts that can help build a pipeline of sustainable fisheries impact investments in the Caribbean. The work is led by the Food and Agriculture Organization (FAO), and Wilderness Markets and others are assessing the potential opportunities for investing to improve the environmental, social, and economic sustainability of fisheries in the region. Below you’ll find a recap of our findings for Grenada; also check our page for the Dominican Republic for that work. Among the fisheries of Grenada, based on the recently completed Fishery Performance Indicators  (FPIs), the commercial longline (LL) tuna fishery holds the greatest promise for the development of triple-bottom line impacts that could then be added to an investment pipeline. 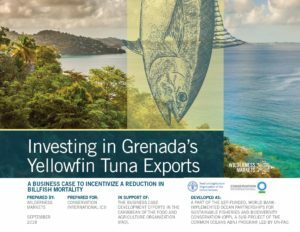 This is most likely to be achieved by linking changes in gear and practices to improvements in operational efficiency and market value by exporting a greater proportion of Grade 1 instead of Grade 2 yellowfin tuna, while linking these efforts to a reduction in blue and white marlin landings . The objective of these investments is to improve supply chain transparency and operational efficiency to improve the market value of export products, thus generating the necessary additional financial incentives to compensate value chain participants – including fishers – for the additional costs of adopting sustainable fishing practices and reducing blue and white marlin mortality. Burns, Anthony; Kerstetter, David. (2018). Desk-review of hook performance evaluation in pelagic longline fisheries. FAO Fisheries and Aquaculture Circular No. 1168. Rome, Italy.